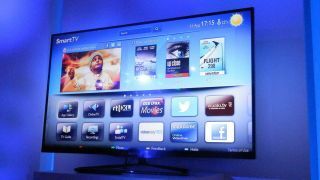 Philips showed off its latest 3D enabled PFL6900 Smart TVs at IFA 2012, with the latest television set boasting a 'frameless design'. Frameless does not mean without bezel on the Philips PFL6900 Smart TV, but the new design is certainly impressive. The first impressions of the television are aided by the new design, Philips specs suggest that the bezel is 1.2mm thin, and it certainly lives up to its billing as unobtrusive despite being made out of anodized aluminium. The new Smart TV functionality was shown off in the Philips TP Vision press conference, and our brief time with the set suggested that the new features will be useful. What absolutely is a decent addition is the remote control with a QWERTY keyboard and pointing capability. It's a little chunky but works just fine for navigating the many menus. Of course, the key thing is the picture quality, and in the less than ideal conditions of the show floor, the Philips PFL690 series held its own. The set boasts the Perfect Motion Rate – variously called 1200Hz and 600Hz by Philips gives a nice crispness to the images and the blacks looked deep with edges defined well. We'd obviously like to spend a little more time with more varied content to really give this set a thorough test, but maker TPVision is adamant that it will cling onto the Philips reputation for decent picture quality, and we would hope that it is the case. We couldn't test the 2D to 3D conversion, or indeed the 3D at all in the time we had, so we can't fill you in as to how some of the key features shape up – but how about a few more pictures (of varying quality) to keep you going until we get a little more time?